Kevin Bauder and Robert Delnay have delivered a long awaited story of fundamentalism written by fundamentalists. Both men are contemporaries and well known among today’s associations, fellowships, schools, and churches. The book is a 2014 Regular Baptist Press volume. If the book has a primary focus it is the history of the fundamentalists in the north, primarily the General Association of Regular Baptist Churches, followed by some significant interaction with prominent fundamentalists in the south. Of the 387 pages of text, the first 262 pages are a history of the men who formed the GARBC from their departure from the Northern Baptist Convention through the Baptist Bible Union years, to the formation of the GARBC and beyond. 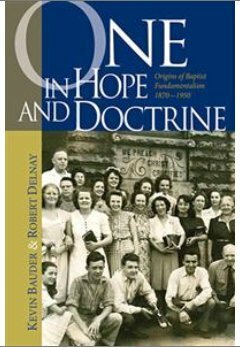 Sign into Goodreads to see if any of your friends have read One in Hope & Doctrine.